Aim Patient redirection can help reduce service demand by providing information about more appropriate services. 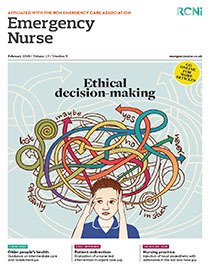 There is, however, no evidence about the effect of nurse-led patient redirection in urgent care centre settings. The aim of this project was to develop and evaluate a nurse-led patient ‘self-care and redirection first’ intervention in an urgent care centre (UCC). Method Adopting a prospective observational design, the intervention was delivered to an opportunity sample of patients who attended a south London hospital UCC, between June and July 2014, and evaluated through patient interviews five to ten days after initial attendance. Findings 118 of the 1,710 people who attended the UCC participated in the intervention, of whom 81 (69%) were redirected to other services or home to self-care, and 37 were transferred to an emergency department. Of the 110 (93.2%) participants who completed the questionnaire, 97.2% were satisfied with the service. Only two accessed different services to those recommended, 72.2% (n=85) said they would not reattend a UCC for a similar condition. Conclusion Treating minor ailments in a UCC is an inefficient use of resources. A nurse-led self-care and redirection intervention can help divert patients with minor ailments to more appropriate services. Further evaluation of the effect of the intervention on service demand and costs is required.